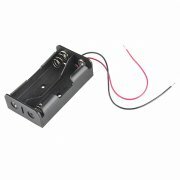 This is an incredibly simple two cell 18650 Battery Holder. When someone thinks of 18650 Cells they tend to think of flashlights first, which is fair since that is what they have been primarily used for. However, with this battery holder you will gain the ability to incorporate 18650 cells into applications like robotics or prototyping by simply dropping one into this device and attaching the leads, that’s it. Every 18650 Battery Holder is equipped with two 6" cables for power and ground, each have been terminated with bare wire leads.